3M Renaissance™ Wireless Vertical Mouse. This mouse is clinically proven to alleviate pain and discomfort of repetitive stress injuries in the hand, wrist, or arm associated with the use of traditional mice-which can pronate the forarm and wrist and typically presses the wrist and carpal tunnel area against the desk. 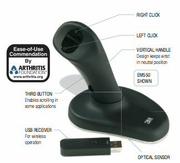 The 3M™ Ergonomic Mouse has earned an Ease-of-Use Commendation from the Arthritis Foundation® for its patented, vertical grip design that keeps your hand and wrist at a neutral angle, while the mouse works as a regular optical mouse. Grip the handle and rest your hand on the base. Use your thumb to left and right click. Optical sensor, wireless, USB compatible plug and play. Soft-touch painted surfaces for added comfort. For right-handed use. 2 year warranty.